From Wylam to Wales, for the most part the punters were elsewhere. Wylam Brewery’s new parkland palace of musical and bacchanalian delight was open for business and the Principality’s Welsh Wizards held the goggle-box fan of the beautiful game in its thrall. Newcastle’s Jazz Café dismissed such alternative attractions in favour of pursuing John Martin’s Hidden Notes. 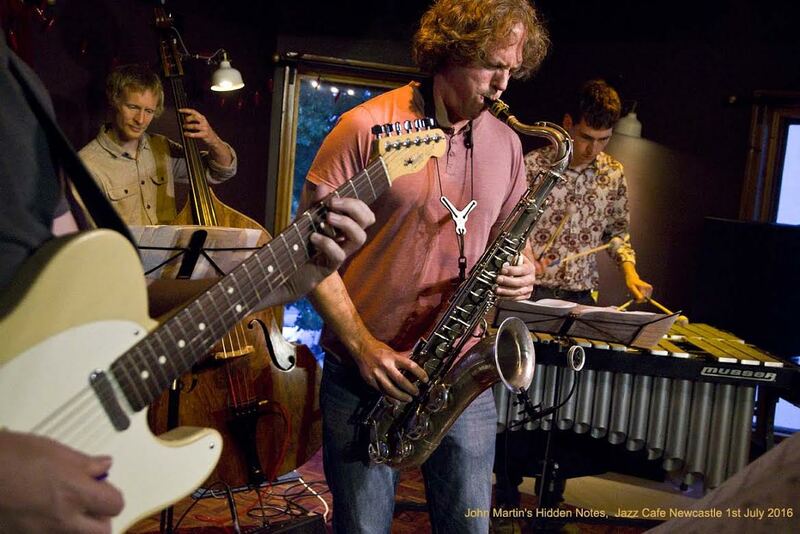 John Martin and his quintet of band mates have frequented Newcastle’s jazz rooms in a number of outfits in recent times; the Bridge Hotel, the Lit and Phil and here at the Jazz Café. 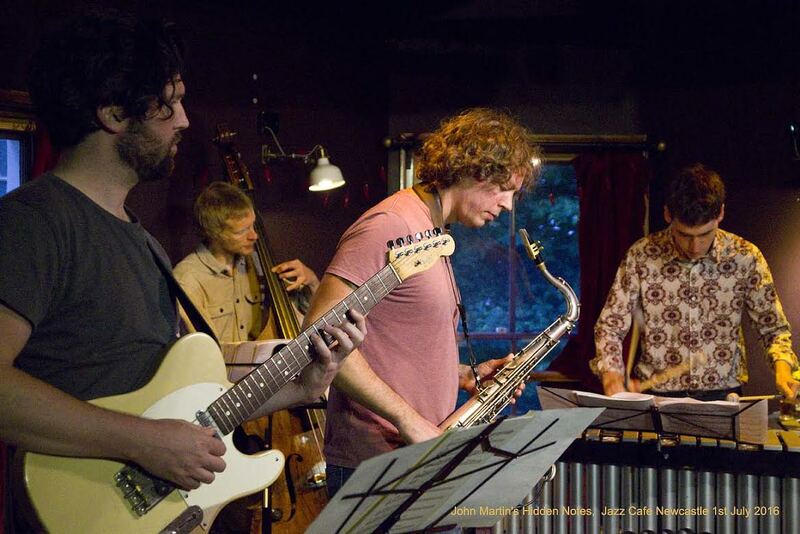 The tenor saxophonist’s Hidden Notes project first saw them record an album and now they are on tour. All of the tunes in the set list were from the F-IRE label CD Spirit of Adventure. This Jazz Café performance burnished the studio recording; John Martin’s exploration of multiphonics in tonal music didn’t in any way constrain his tenor playing on the evening and Ralph Wyld’s dazzling four-mallet vibes playing impressed again a matter of days after his appearance with Tim Richards. Heptopia opened the programme with the leader in robust form. A more muscular approach to that heard on the album, it was good to hear John Martin stretch out a little. Rob Updegraff’s Telecaster prompting and probing added to the mix as the two Tims – bassist Fairhall and in demand drummer Giles – were right in there, fully immersed in Martin’s compositions. The bluesy Folklore steered a grittier path and, as the composer Martin referred to it, the ‘disgruntled’ Giant’s Stomp showcased Wyld’s vibes with Fairhall’s walking bass line a guiding light. The new album’s title track Spirit of Adventure hinted at an Eastern theme with Updegraff’s scorching solo a highlight as Tim Giles’ trademark rattling percussive style impressed an attentive Friday night crowd.